The pace of innovation and change within multichannel retail is breathtaking. At the same time, it can also be a challenge to understand which technologies will have the most impact with consumers and should be considered by retailers as part of a multichannel strategy. 1. Mobile couponing. Mobile couponing has been around for some time, but has seen limited effectiveness due to difficulty in making them relevant, personalized, and timely as well as a lack of consumer willingness to adopt them. However, mobile technology has changed what is possible and mobile couponing is now one of the top activities consumers who use mobile devices for shopping planned on doing. Retailers can now deliver coupons to shoppers on mobile devices based on location, past shopping behavior and preferences, moment of need, and that are paperless, making them convenient to redeem. How to think about it: What will separate retailers who are successful with mobile couponing from those who are not, will be the approach they take to mobile coupons. 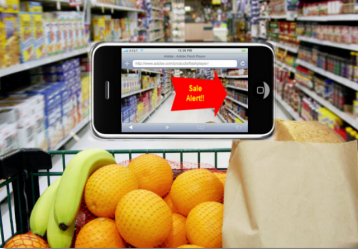 Specifically, we believe that retailers who will succeed with mobile couponing are those who approach it differently. Consider integrating mobile coupons throughout the core mobile shopping experience, delivering them beyond traditional push approaches like SMS and rather through LBS, 2D codes, NFC as well as integrating mobile coupons through all touch points, including social networks. 2. 2D Codes. 2D codes suddenly seem to be everywhere—from billboards to magazines to in-store displays—mainly because they are a quick and relatively inexpensive way for marketers to connect the physical world to the online world. They are also effective. Retailers such as Barney’s New York have used QR codes to energize traditional media efforts, while others such as Columbia Sportswear have used QR codes to bring products to life to shoppers in-store. How to think about it: 2D codes still have a number of challenges to overcome before reaching critical mass. Standardization of code technology (open QR codes v proprietary MS Tags), reader availability, and consumer awareness are the main challenges. They also face long-term obsolescence from NFC (see below), but that is a ways off in the future. 2D codes do not require a lot of time or money to implement and can have large potential returns, so experimenting with them while the cost of learning is low is worth considering. 3. Location based services. Utilizing location based services (LBS) to its fullest potential has eluded retailers mainly due to poor location technologies, cost, user experience, and consumer awareness and adoption. However, that is quickly changing with the emergence of mobile technology as an enabler (i.e. GPS, push technology, app multi-tasking), and the rise of consumer awareness (mainly led by the success of consumer apps such as Foursquare, Gowalla, and SCVNGR) as well as increased consumer willingness to receive location-based offers. Location-based services give retailers a way to take the in-store experience to a much richer, deeper level, which in turn increases brand loyalty and transactions. Examples include: using LBS to provide contextual and relevant offers as consumers are nearby or enter a location, greeting customers when they visit a particular location, informing them of in-store events (the Apple Store app is a great example of this), assisting in locating items (see Tesco’s Finder app), offering rewards for visiting a particular location and providing timely upsell opportunities so customers do not leave empty handed. How to think about it: LBS is a reality today and will continue to grow in the future, so retailers should consider it part of the multichannel mix. LBS should be thought of in two buckets— third party services (or apps) and what can be provided in the retailer’s mobile shopping app. Third party services, such as Foursquare and Facebook Deals give retailers the opportunity to offer shopping incentives and should be viewed as a channel to reach consumers. Retailers should also seek to build LBS services directly into their own mobile shopping applications Also, looking for ways to integrate third party services into the retailers shopping app (such as ability to check-in on Foursquare directly in the retailers shopping app) represents another opportunity. 4. Augmented reality. We believe that augmented reality (AR) will be a disruptive technology that changes how consumers interact with their environments, being a primary conduit for connecting the digital world and the real world. While AR is in its infancy today, global revenue for augmented reality (AR) is expected to hit $1.5 billion by 2015, much of that coming from leading brands and retailers investing in AR apps and services. We’ve already seen some early successes with AR technology, such as Converse’s The Sampler mobile app, Ikea’s iPhone app, and Lego’s AR kiosk. Some have even yielded noteworthy results, such as Dabs Acer’s AR ad, where 70% of the users to the site chose the live experience and of those 13% converted—not bad results when compared to a normal low single digit conversion rate of most ecommerce sites. How to think about it: Most early AR success is on mobile devices since it taps into the unique capabilities of mobile: personalization, context and immediacy. They also solve a practical problem for the shopper. Eventually, AR will propagate more widely to other multichannel touchpoints, including merging with other technologies such as LBS, 2D codes and NFC. Consequently, in the short-term, look for ways to use AR as part of your existing mobile native app while monitoring AR technology and consumer adoption for longer-term opportunities. 5. NFC. Perhaps more than any other emerging technology, near field communications (NFC) has the potential to be the most disruptive and have the biggest impact for retailers. NFC will impact much more than mobile payments. It will link together applications and services across different industries, including mobile commerce, mobile marketing, and mobile customer relationship management. For shopping, consumers will be able use NFC to check-in to locations, acquire and redeem loyalty points and coupons, learn more about products, and use it as a form of payment. However, NFC must overcome some challenges before it’s an every-day reality for consumers: standards must be agreed upon, the NFC ecosystem must be built out (device manufacturers including NFC chips in devices, merchants upgrading POS, financial institutions, network operators and others agreeing upon transaction flow and fees), and consumer awareness must be raised significantly. NFC is already used widely throughout Japan and increasingly in Europe. Device manufacturers will play the biggest role in pushing NFC forward in the US and into more wide scale use globally, along with mobile OS and payment providers, such as Paypal and Google. An early example of this is the Nexus S on Android being the first NFC-compatible device on the market. As more NFC devices ship and mobile payment providers push what is possible at POS in-store, NFC will start to realize its potential to transform how consumers shop. How to think about it: While NFC has a ways to go before mass adoption, retailers should learn from other technologies, such as 2D codes and mobile point of sale (mPOS), as ways to learn consumer habits and apply those lessons to the NFC when the ecosystem matures. Also, thinking about NFC in terms of consumer interaction before driving transactions will help raise consumer uptake. For example, Google is using NFC-enables smart stickers with Google Places to help consumers learn more about local businesses as well as rate and review their products. Not only are local businesses providing valuable information to the consumer with the Google Places NFC stickers, but they are also helping consumers build trust of NFC technology and are paving the way for consumer trust of NFC for transacting in the future. ← So You’ve Got a Mobile Commerce Website, Now What?